Where they are displayed The most tangible or noticeable difference is where your listing would appear on the SERPS (stands for search engine results page) under each method. (See video)As you can see, the PPC listings on a Google results page are displayed as the top two or three listings (in a light cream background and labeled “sponsored results”), as well as on the right-hand side column. 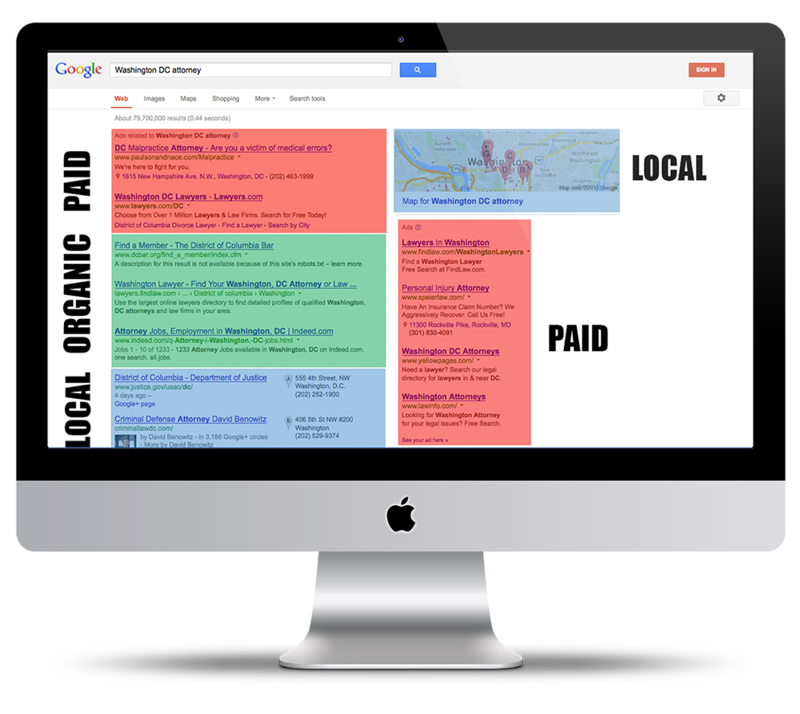 Note that there are not always PPC ads in the top region, generally, you’ll only find that for search phrases where there are a lot of firms bidding for traffic. If only a few firms are competing for the paid spots, you’ll generally only see the ads on the right side. Organic listings are also sometimes just thought of as the “regular” listings. Another key difference is the traffic potential of each method. It’s generally much faster to obtain paid listings. It only takes a day or so to set up a campaign, although it can be an ongoing process to really manage it efficiently. That all said, the organic listings actually tend to produce much more traffic for the same search phrase, all things being equal. Generally, most studies show users are three to five times as likely to click on a site in the organic listings than to click on a paid ad in the search engines. Ad blindness and/or bias or preconception as to the relevance of the ads in many user’s opinions may well be the cause. Well, PPC (pay-per-click) literally costs per click. With Yahoo you bid for position – the higher the bid the higher the position you’ll get. In some cases the top positions are well worthwhile, and in some cases you can find better value outside of the top spot. With Yahoo, it’s a set price for each click.Google’s pricing is much more dynamic, its not really possible to give a true cost, but rather an average cost is used. Looking for a real number here? Well we’ve seen clicks cost as low as 5 cents per click to as high as $20+ per click – so it truly depends on your market, the competition, etc.SEO doesn’t cost “per click”. Sometimes its referred to as “free” traffic or ‘organic” traffic, being that you don’t pay per click. Rather, the cost is simply much less tangible – but it does exist. Essentially the costs for SEO are the costs of building a great site, building awareness about your site online (including attracting links to your site), optimizing your HTML code, and if possible hiring an SEO expert as a consultant. You may very well need an SEO expert – especially if you have a new website or if your site does not currently have much awareness and traffic.SEO used to be about technical revisions and tweaks and such, but nowadays the search engines have improved such that it’s quite simple – build a really valuable site. Its not just enough to want to rank #1 for a search phrase, you need to justify why your site is truly worthy of that. Sorry, no shortcuts here. Implementation – Do I need to Edit or Revise My Website? We recommend using a combination of both when first starting your internet marketing campaign. When you first start SEO on your website you wont see results for at least 30-90 days, this is where pay per click marketing comes in handy. PPC can provide a perfect bridge for visitors and results while waiting for your search engine optimization to kick in.